The Booking Activities flagship module Display Pack is now gaining a new display option: the list view. Your events will be positioned one below the other, in a list divided into day. For your customers, the principle remains the same, they just have to click on the event of their choice. Then the event will be visually selected, and they can proceed to the reservation. To activate this view, go to your planning editor. 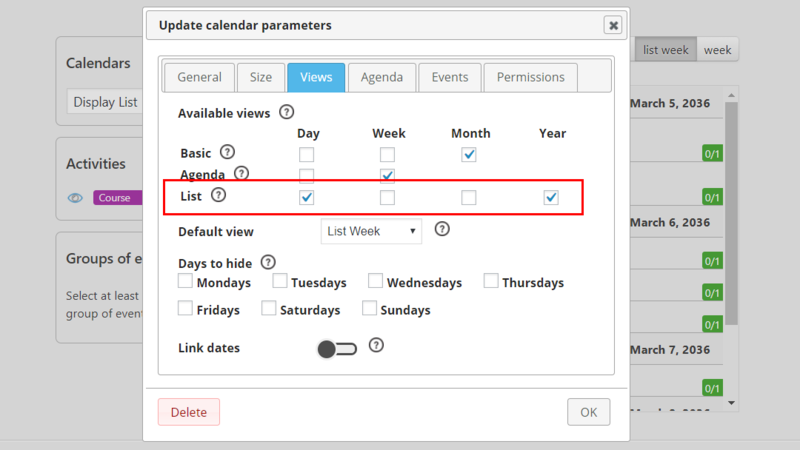 Edit the desired schedule, in the “Views” tab you can select the “list” views among daily, weekly, monthly and annual. In addition to this major new feature, Display Pack version 1.2 offers some additional customization features. Week numbers and dates can now be used as links to more specific “Agenda” views: weekly and daily.